Hi all....Laura here today for The Rubber Cafe', with a Creative Cafe' KOTM birthday card "bringing on the cake" and also a quick tutorial on a woven ribbon background. As I finished each pink piece, I also tacked that down with Scor-Tape. The pink "woodgrain" frame, is a 3&3/4" square with a 2&1/2" square cut out of the center. This frame piece is glued directly to the woven ribbon piece. Then the entire frame is foam taped to a 4" by 4" square of kraft cardstock. Before I glued this all to the card, I tied a bow around it using the blue seam binding, and I tucked in a 1" (pink floral paper) and 1&1/4" (multi floral paper) banner underneath. To decorate the card, I stamped and fussy cut out the "Happy Birthday" banner sentiment and glued to the upper left corner. 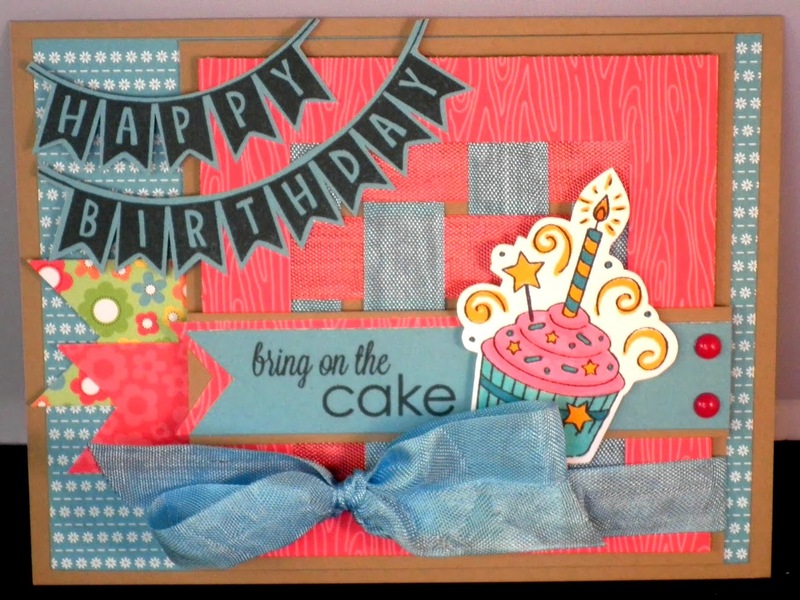 Next I stamped the "bring on the cake" sentiment in Black Memento Ink on a 3/4" by 4" strip of blue paper trimmed as a banner. It's layered with a piece of pink woodgrain paper of the same size and all glued using Scrap Happy Glue to a 1" by 4" strip of kraft cardstock. Candy shoppe dots are added to the right side. The cupcake is stamped in Memento Ink on Pugnacious White paper, then colored in using Copic Markers Y17, YR07, BG05, RV06, RV13. After cutting around the image, it was foam taped to the card. Inspired to create some handmade birthday cards? With the winter winds blowing, it's the perfect time to create and make all those cards, for all the birthdays year round! Thanks for joining me here at The Rubber Cafe' today! What a great technique with the weaving - thanks for sharing!